The Phoenix area is a hiker’s paradise. South Mountain Park with 16,000 acres (which is equivalent to 24 square miles) and more than 50 miles of trails may be the largest municipal park in the country. The Mormon Trail offers panoramic views of Phoenix with a 1,000 foot elevation change in just over a mile. 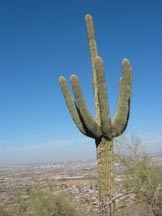 Picturesque saguaro cacti, strategically placed, add interest to the view. Near the summit compass barrel cacti are prominent. The Lost Dutchman State Park at the base of the Superstition Mountains near Apache Junction is another good hiking area. The Treasure Loop Trail is about 2.5 miles with an elevation gain of 500 feet. In addition to the stately saguaro cacti, we identified chain fruit cholla and prickly pear cacti. Nearby Goldfield Ghost Town offers a sense of what life in the West might have been like in the 1890s. The Desert Botanical Garden is a wonderful place to see and identify desert plants. The many varieties of aloe and examples of organ pipe and cardon cacti were particularly striking. Several colorful Gambel’s quail dutifully bobbed their heads and two cottontail rabbits near the trail tried to hide from us. An evening stroll along the manmade lake in nearby Tempe Beach Park and Town Lake is a pleasant contrast to hiking in desert areas. The Phoenix area is great for hiking, especially with temperatures in the 70s. The Grand Canyon is a truly spectacular sight. We stayed at the historic El Tovar Hotel on the South Rim and enjoyed a fine dinner and breakfast at its restaurant. We walked a couple of miles to Yavapai Point which is 2,400 feet above sea level. The canyon below dips some 4,500 feet and it is about ten miles across to the North Rim. 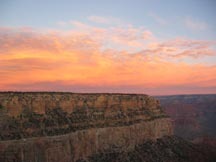 The Grand Canyon contains 277 miles of the Colorado River. We took the eight mile free shuttle to Hermits Rest with stops at the Trailview Overlook, Maricopa Point, Powell Point, Hopi Point, Mohave Point, the Abyss, and Pima Point. Our early rising was rewarded with a colorful sunrise. We traveled to and from the Grand Canyon on the Grand Canyon Railway. The 65-mile trek from Williams, Arizona featured entertainment as well as a scenic panorama. While waiting for the train, we were treated with a Wild West show. By traveling first class, we enjoyed pastries and a huge bowl of fresh fruit on our trip to the Grand Canyon and vegetables, cheeses and crackers on the return trip. Clarence Clearwater soulfully entertained us with native and world music before train robbers boarded and took what remained of our money. Our spirits were bubbly, however, as our amiable hostess kept filling our glasses with champagne. Thumb Butte’s distinctive silhouette is clearly visible from downtown Prescott. 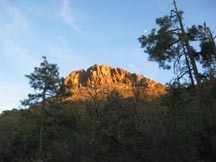 This prominent landmark rises about 1,000 above the Prescott area. A hike on the Thumb Butte Trail provides panoramic views of this city which became Arizona’s first territorial capital. The Sharlot Hall Museum is an excellent place to explore the area’s interesting history. It includes the Governor’s Mansion, a high-end log cabin, built in 1864 and home of the first territorial governor, John Goodwin. Surprisingly, a few roses in a rose garden honoring Arizona’s pioneer women were still in bloom. Nearby, the distinctive Yavapai Courthouse is centered on a block banded with a wide brick walkway. One sidewalk features a timeline with important local dates and events and a statue honoring Buckey O’Neill, a local boy made good as a captain in the Arizona Rough Riders. Soon the lights will be turned on for the holiday season, supporting the city’s claim as Arizona’s Christmas City. What a difference a year can make. At last year’s King Island Open I was humbled with a disastrous 1-4 record. Granted this year’s sections were divided differently than last year, but my 3.5-1.5 score included two wins characteristic of a swashbukling style of play not seen for some time. It was particularly sweet to win a game exploiting an attack on the g6 square. Gautam Nagendra topped the field of 65 players in the Under 1900 section with a 4.5-0.5 record. In the last round he beat the only undefeated player, Fred Long, who finished in a six way tie for second. Three Grandmasters and five International Masters played in the Open section of 49 players. GM Gregory Kaidanov from Kentucky, International Master Emory Tate from Indiana, and Ohio State Champion Carl Brandon Boor tied for first place with 4-1 scores composed of three wins and two draws. There were 53 players in the Under 2100 section and 58 in the Under 1700 section, including Jim Dohnal, Marysville, with 2-3. Anton Freihofner, Delaware, tied for 9th place with 3-2 in the 53 player Under 1300 section. Allie Claar, a freshman at Delaware Hayes, won prize money for her undefeated 5-0 record in the 36 player Under 1000 section. This year’s tournament had 344 participants making it the largest chess tournament in the state of Ohio. “Just Plane Fun!” at the Museum of Flight was EDUCAUSE’s special conference-wide event. The restored Red Barn, the birthplace of the Boeing Company, offers a different aviation history than encountered in Dayton’s National Museum of the U. S. Air Force. For example, the Wright brother’s very broad 1904 flying machine patent created major difficulties for competitors, including Boeing, for more than a dozen years. The six-story Great Gallery contains more than 40 historic aircraft. The Tower is a full-scale replica of an air traffic control tower. 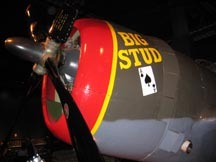 The Personal Courage Wing features World War I and II fighter aircraft and displays. The event also offered good food and live music thanks to Microsoft.